While on a research trip in Peru, science journalist Alice Robb became hooked on lucid dreaming—the uncanny phenomenon in which a sleeping person can realize that they’re dreaming and even control the dreamed experience. Finding these forays both puzzling and exhilarating, Robb dug deeper into the science of dreams at an extremely opportune moment: just as researchers began to understand why dreams exist. They aren’t just random events; they have clear purposes. They help us learn and even overcome psychic trauma. Robb draws on fresh and forgotten research, as well as her experience and that of other dream experts, to show why dreams are vital to our emotional and physical health. She explains how we can remember our dreams better—and why we should. She traces the intricate links between dreaming and creativity, and even offers advice on how we can relish the intense adventure of lucid dreaming for ourselves. 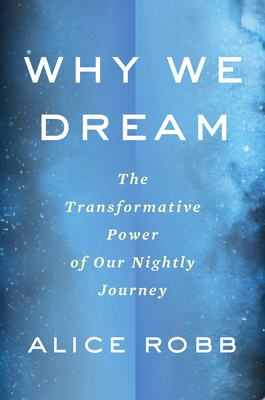 Why We Dream is a clear-eyed, cutting-edge examination of the meaning and purpose of our nightly visions and a guide to changing our dream lives—and making our waking lives richer, healthier, and happier. ALICE ROBB is a columnist for New York’s Science of Us. Formerly a staff writer at the New Republic, she has also written for the New Statesman, Foreign Policy, Elle, Vice, the Atlantic, and the Washington Post, among others. She lives in Brooklyn.